In my last post i shared a few helpful apps for your instagram , today I’d be sharing some mobile apps that i feel don’t get the mention they deserve even though they are so useful , these three apps provide super simple and meaningful interactions with technology and would definitely be essential in your everyday life. The Period Tracker app; is an easy way to track your periods, especially if you are one of those people like me who never learnt to calculate their periods on their own ( I swear I have no idea how it works) and instead end up having to keep menstrual pads in their bag all year long. All you have to do is press a button at the start of your period every month. The tracker calculates the average of your past 3 months and predicts the start date of your next period . Easy!!!! It can do so much more, download period tracker here and see for yourself. Filmora Go ; is an easy to use video editing app, where you can add music , transitions, visual themes you can trim clips, add voice over, speed up or slow down a particular section of your video, add titles and subtitles to your video e.t.c. In summary it’s an all in one mobile video editing app with a lot of the tools and functions of a professional video editing app only easier. With the way video content is being prioritized these days you definitely need this easy app on the go. I sincerely hope that you found this post useful. 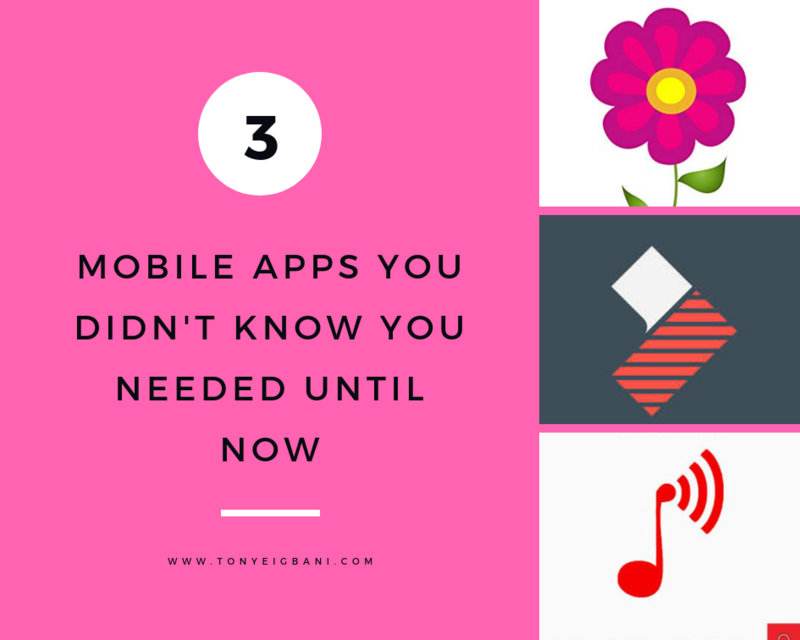 which of these apps do you think is the most useful ? Which would you be downloading? This post is really helpful. I have the period tracker and it’s really easy. i didn’t even know that knowing your start and end dates of your period was a vital thing till i visited the doctor recently, sinc e then, i’ve been an advocate for period tracker lmao. Useful apps i have on my phone are; spending tracker, helps to keep track of my spendings, my banking app has been super helpful too. The music app you mentioned above sounds like magic lol, i’m off to go download because surfing the net to download a song can be stressful atimes. Thanks love. ← A 4 Step guide to growing your Instagram following in 2019.